Yesterday I was in Toronto. It was another whirl-wind visit of less than 24hours…not for visiting friends but to do 3 things: go to an optometrist and doctor appointments as well as get my hair cut! I’m not sure if you have noticed…but it had gotten quite long. Yes, it’s true I do live in a place that doesn’t have hair stylists. Because of this I only really cut my hair every 6months or so (when I get south)… it’s been a perfect situation to let it grow. When I posted about my ‘knitting an afghan’… my mum’s first comment to me on the phone was about how LONG my hair had gotten! 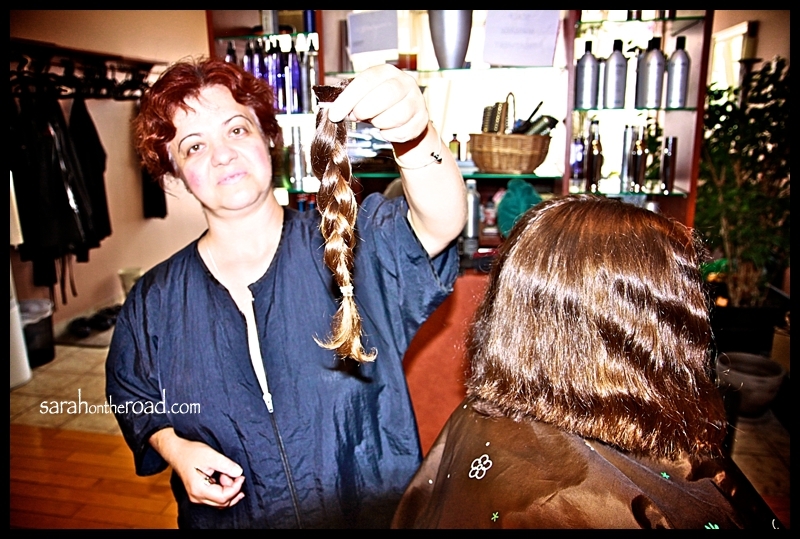 For a long time I’ve wanted to grow my hair, and then donate my braids to make wigs for Cancer patients. So yesterday, my hair had reached just above the ‘required minimum length’ of 8inches. I was talking to Kat (my sis-in-law) at the cottage on Tuesday about somewhere to go get my hair cut. She suggested I get in touch with her hair stylist, Effie at Elements Hair Design. So I called, and booked an appointment. 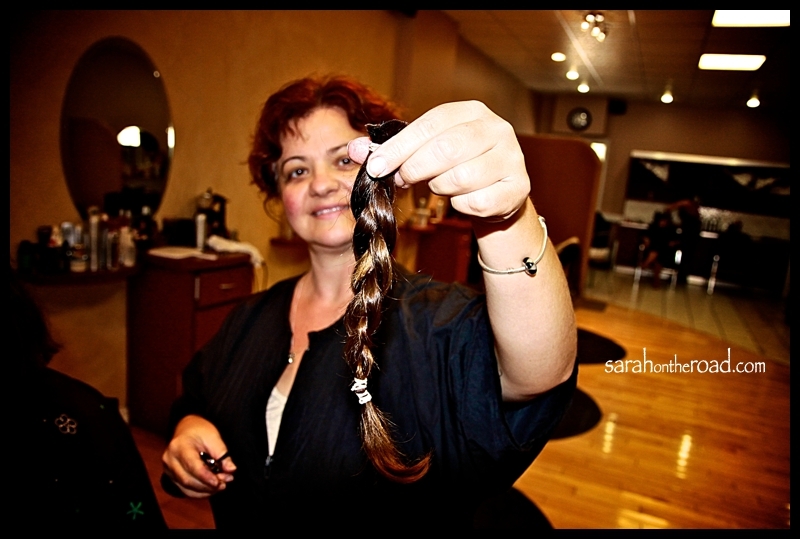 Off I went Friday at 12:30 to get my hair chopped off…. 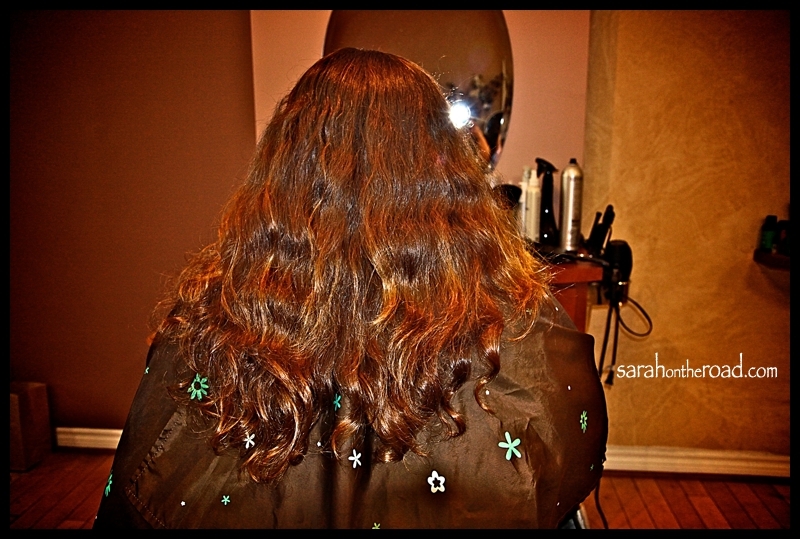 This is the last shot of my hair, all brushed out before the big cut. Effie then measured and braided my hair… I still can’t believe how long it was… because it didn’t seem that long, but I look at the picture and I’m like WOW! Kat and I took some time to look over hair magazines to get an idea of a style… it was decided, short at the back, longer at the front…with NO Bang…but hair I can tuck if I want… and some thinning needed in the back! I wanted something I could straighten if I wanted but also wear curly… I’m a pretty low maintenance kind of hair gal, wash and go is totally me! After a quick hair wash, I was back in the chair… I looked at the mirror and was like…where did my hair go?! 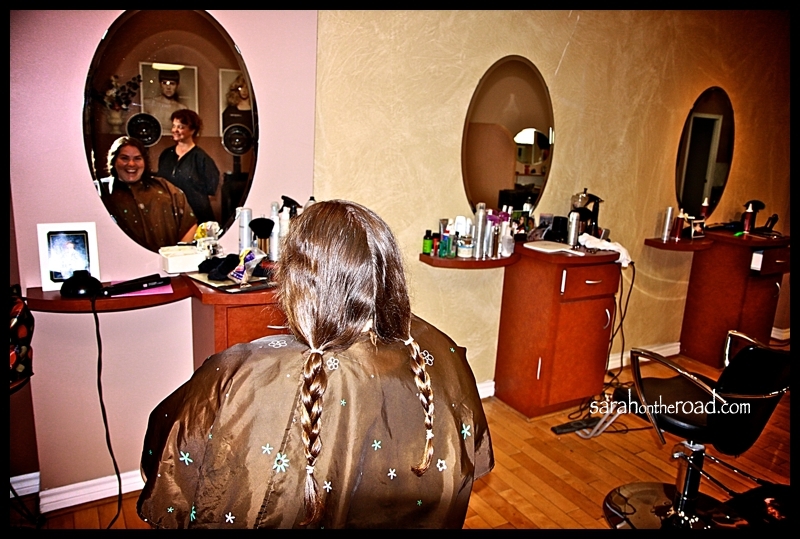 First looks of the back and side of my new do…. Thanks so much Effie! 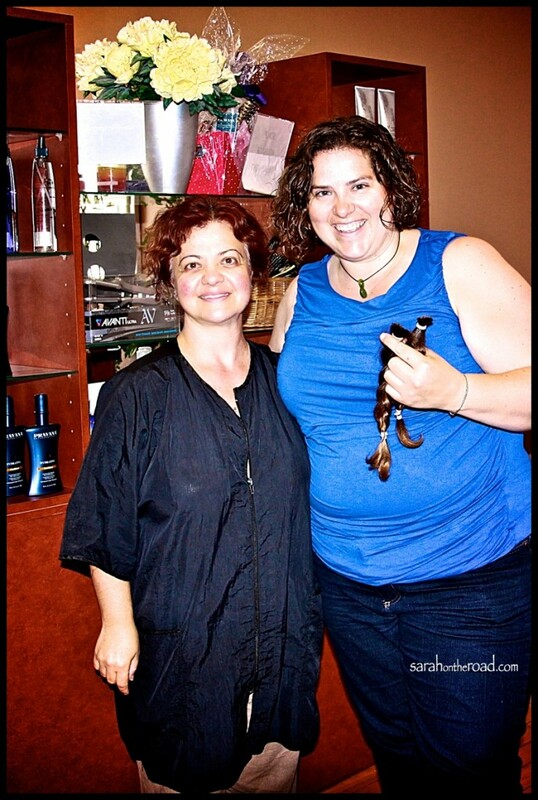 It was great meeting you… I can’t wait until the next time I’m in Toronto to get another cut! 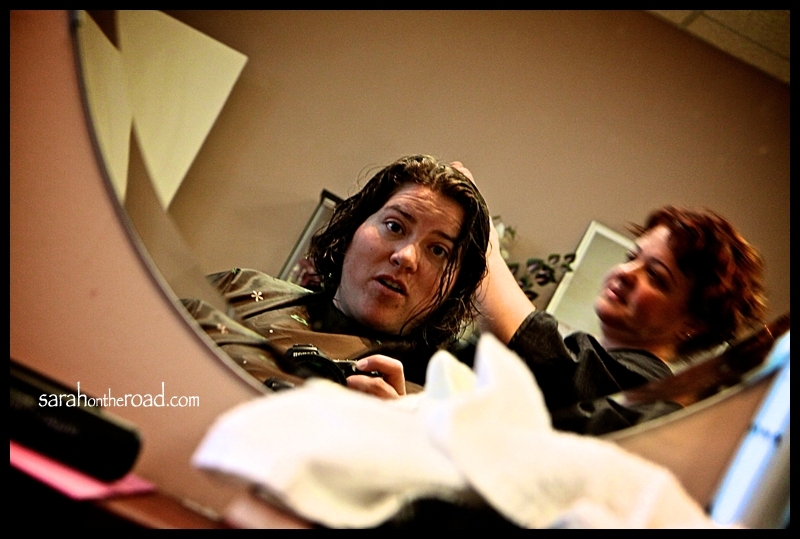 If you are in Toronto and need a stylist… please go see Effie at Elements Hair Design at 1035 Coxwell Ave! Honestly, I’m in love with this hair cut! 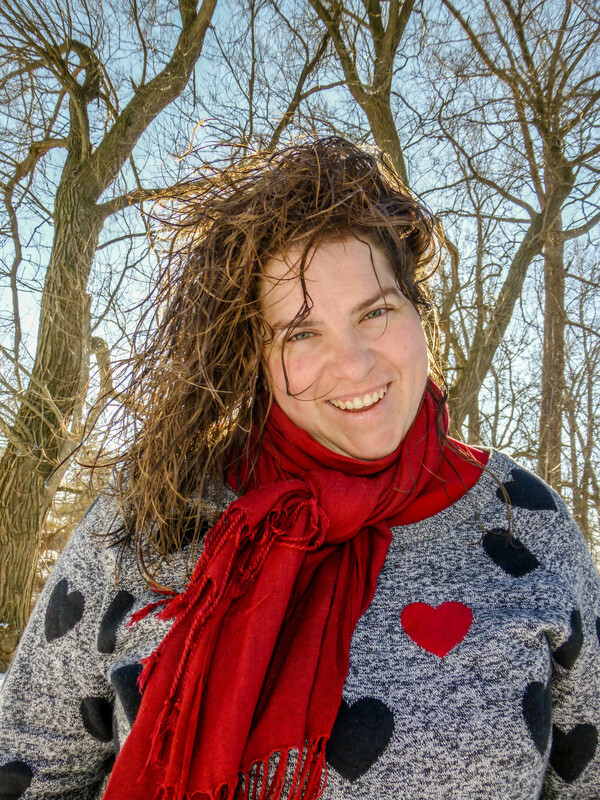 When I got to my mum’s in Haliburton I had to take these self-portraits… to document the ‘salon-magic’ that happened yesterday! 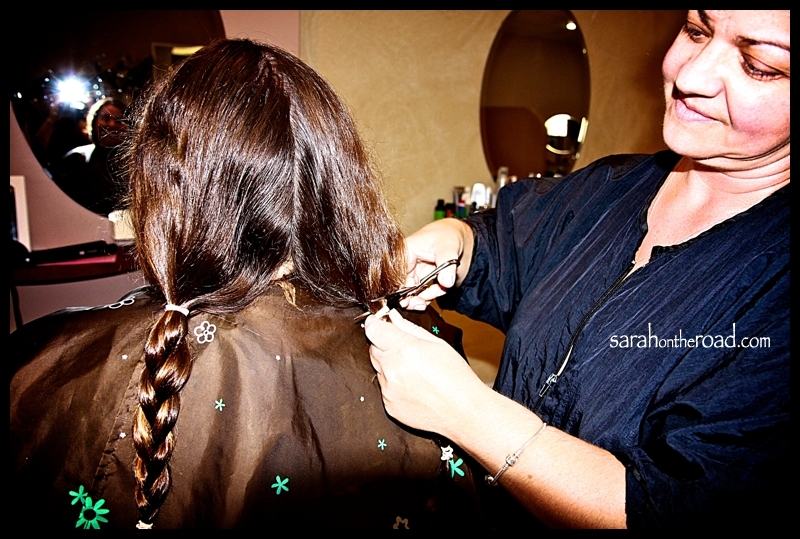 Effie shared some wonderful ‘secrets’ of the salon… so I will attempt to make my hair look like this again at some point. Thanks again Effie! All tonight I’ve been putting my fingers in it… and still can’t believe it’s so short in the back. 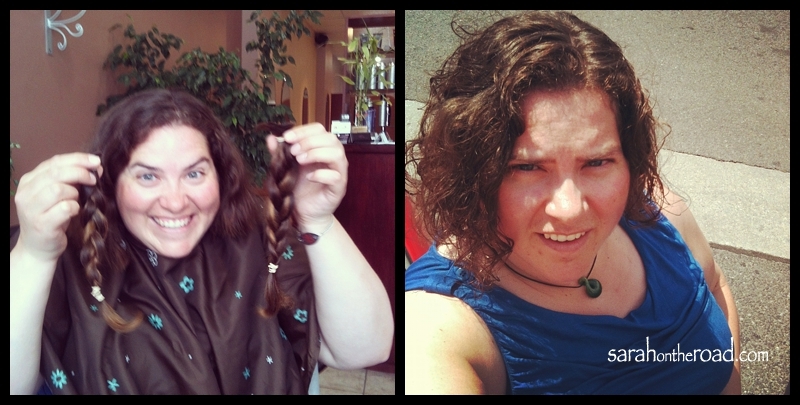 I have no regrets though…it was time to make a change, and to get a cut! I’ll be taking my camera…and I’m sure I’ll have some ‘stories’ and ‘photos’ to share when I’m back in the land of technology. I’m going to enjoy my time being a bit more ‘unplugged’… well we’ll see how long that lasts! This entry was posted in Random, Rants & Reflections on July 28, 2012 by Sarah on the Road. Awesome cut and btw those BC pics are awesome as well! Love your new haircut. I had my hair cut in town here by Kristen – she is good is you need to get one here. I am debating whether to go see her again before I leave to save myself one less appointment. My first week home is booked. Your vacation looks awesome. Can’t believe all the stuff you are doing. I can’t wait to get on that plane on August 10th or sooner. Sealift is delayed again due to ice in the mouth of harbour. Your cut looks super good, really fresh! I have visited your blog and I am going to be following it from now on. Though the choice is yours, however, I would be honoured if you follow my blog so that you could get the notifications of any new posts that I make.